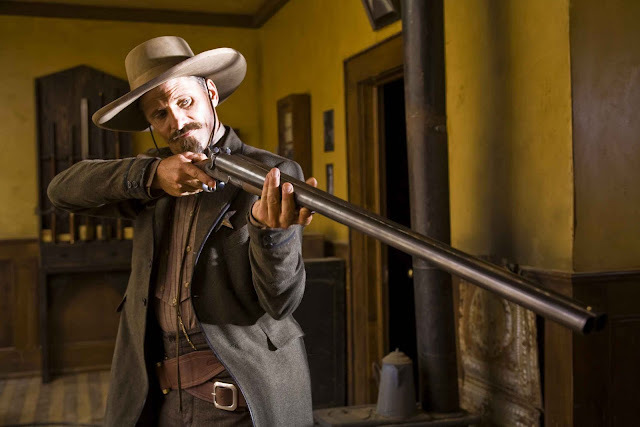 Appaloosa is Ed Harris' second effort at direction (his first being Pollack, nine years ago) and, as second efforts go, definitely qualifies as a backwards step. Once again choosing to direct himself, Harris stars as Virgil Cole, one half of a freelance law-keeping duo which is completed by Viggo Mortensen's Everett Hitch. Together they are employed by the townsfolk of Appaloosa to protect them against Randall Bragg (Jeremy Irons, sporting one of the best 'this-guy's-an-evil-genius-in-a-western names' I've ever heard). The problem with Appaloosa is that it is a film with more good ideas than it has time or care to deliver and pick through properly. You can almost see Harris sketching out shots and plot lines and thinking they're all so good that he doesn't want to waste any. The relationship between Hitch and Cole for example, whilst obviously loyal and complex is given a lot of twee buddy moments that just aren't needed (it is hinted at that Cole might be illiterate, often having to ask Hitch to finish his lines for him). The end result of this is that the story suffers markedly. Quick jumps between situations Harris has planned occur on a regular basis, completely destroying the myth of a chronological story. In one section, Cole and Hitch partake in a huge gunfight and are injured as a result. The scene ends in a fade-out with Renee Zellwegger's character (yes, she's in it to, I'll get to her) running over to the two gunmen. The next scene fades in. The two are both up and well (Cole has a cast on his leg) and in a completely different location where several things have apparently changed since last we saw them. The problems with Harris' mastery of story-telling (or lack there of) roundly prevent Appaloosa from being a 'good film' but it is stopped from being an even average one by some really poor performances. Mortensen is probably the only one of the leading lights to emerge with anything like some solid acting he'd be proud to see on his CV. Harris is one-note and does his own brand of open-your-mouth-to-convey-depth look on too many occasions. Irons' and fellow Englishman Timothy Spall have various accents depending which bit of the film you're watching and both do nothing other than inhabit stereotypical roles. Zellwegger is also particularly poor despite some admitted promise early on (as a fellow blogger commented, she is 'at her squintiest'). All in all it's a poor film and if Harris is to dip his toe in direction again he would be best to a) give the acting duties to someone else or b) listen to his Producer more. Ugh I was so bored watching this movie. It felt so disconnected, and forced, as if it was trying to be Open Range meets Warlock but failed to live up to either. I thought it was a nice visual film but I'd never sit through it again.